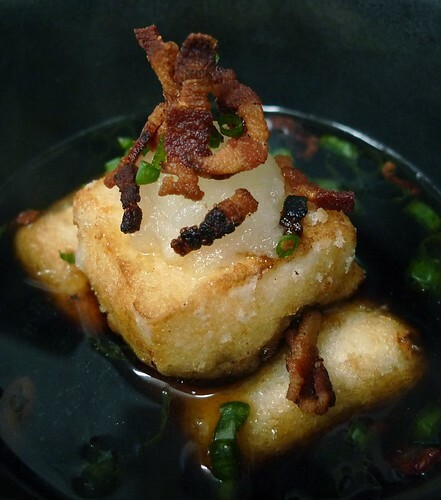 Bacon Agedashi Tofu, inspired by the Momofuku cookbook. The first recipe in the Momofuku book that really got my attention was the bacon dashi. In the book, Chang says that when Noodle Bar first opened, he had a hard time finding good katsuobushi (smoked bonito) to make traditional dashi, the seaweed and fish broth that’s the foundation of Japanese cuisine. Chang started looking at other options to replicate the katsuoboshi’s smoky flavor, and good ol’ American bacon was the natural choice. Making the bacon dashi is pretty easy, and the final product looks and tastes like regular dashi but with a hint of smoky bacon flavor. It can be used in any application that calls for a regular dashi, and the first thing I thought of was one of my favorite dishes, agedashi tofu (fried tofu in broth). For the broth, a.k.a. tentsuyu, I started by warming one cup of bacon dashi in a small sauce pan and added about three tablespoons each of shoyu (soy sauce) and mirin (sweetened rice wine). I did this to taste, but it should be salty and smoky with a hint of sweetness. Butterfly a block of firm tofu and separate the two halves. Cut the tofu into rectangles and dry them for about 10 minutes on paper towels. Gently dredge the dried tofu in potato starch or cornstarch and fry them in 350F oil until they’re light golden brown. In a separate pan, fry up some finely chopped bacon until crispy. Chop up a stalk or two of green onions and grate some brown onions. Normally, you’d finish off agedashi tofu with grated daikon, but I didn’t have any on hand. Using onions did keep the dish a bit more on the American side and provided a similar texture to what grated daikon would have provided. To serve, place three pieces of fried tofu in small bowl. Ladle enough sauce into the bowl so that half of the tofu is still exposed. Top with grated onion, chopped green onion and crispy bacon. Arnold, that is a stunning picture. I just want to grab it off my screen and eat it. Can’t wait to make this! Niiiiice… Tell you what – you come to France with some San Jose Tofu Company tofu (god, I miss their stuff), and I’ll grab a slab of poitrine fum�e cured by my butcher and we’ll have an intercontinental mouthgasm. Looks awesome, can’t wait to try it! Oh. Yeah. Baby. Bring it.